This past Wednesday, ten ISTP 5th graders had the once-in-a-lifetime chance to meet the President of France! 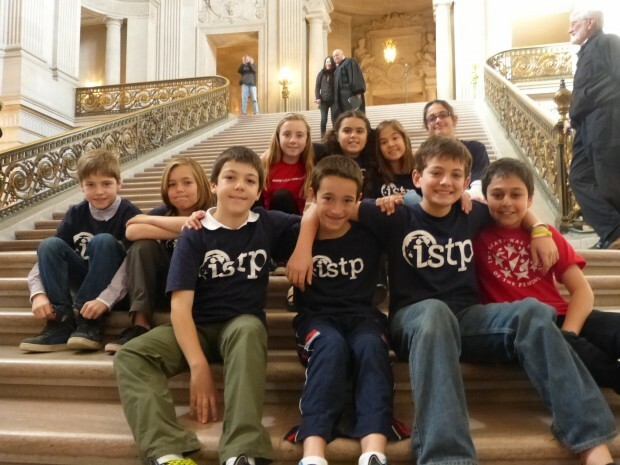 ISTP was invited by the City of San Francisco, along with other French-American schools in the area, to send a delegation of students to greet President Hollande. The lucky students from the 5th grade French Program were randomly chosen in a lottery during assembly. They included: Seth K., Alexis B., Navid K., Nick B., Guillaume L., Caroline B., Leila E., Ella S., Alex K., and Maya K.
President Hollande, along with a group of French entrepreneurs, visited San Francisco with the goal of establishing stronger ties between French and Bay Area tech industries. 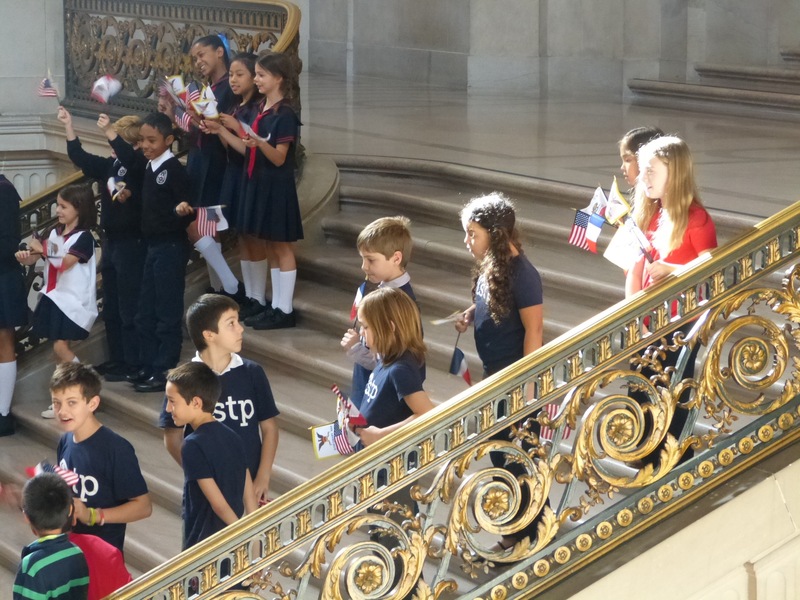 When Hollande arrived at San Francisco’s beautiful, grand City Hall, ISTP’s 5th grade representatives were on hand to enthusiastically welcome him. 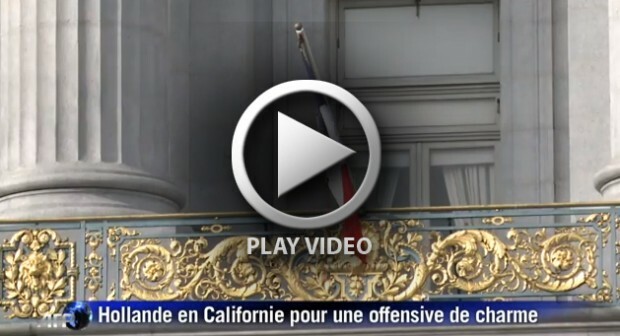 Students stood on the front steps, each waving four different flags – the French flag, the American flag, the California flag, and the flag of the City of San Francisco. Students prepare for the President's arrival. ISTP students were also invited to prepare a welcome letter for the president. 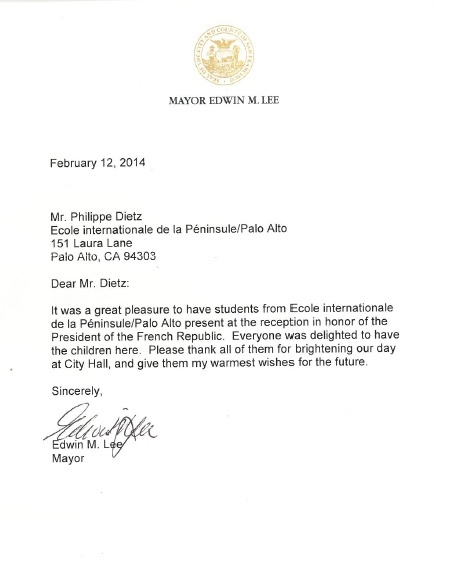 Students gave their letter to City Hall, to be delivered later to the very busy president. The President gave a speech in City Hall, followed by a reception, where Head of School Philippe Dietz was able to meet President Hollande. Philippe says, "I was able to exchange a few words with the President, reiterating the importance of French-American education in California." Students were excited just to be in the presidential welcome party, and no one was expecting what happened next. As the 5th graders waited to depart for home, they received a surprise personal greeting from the President! 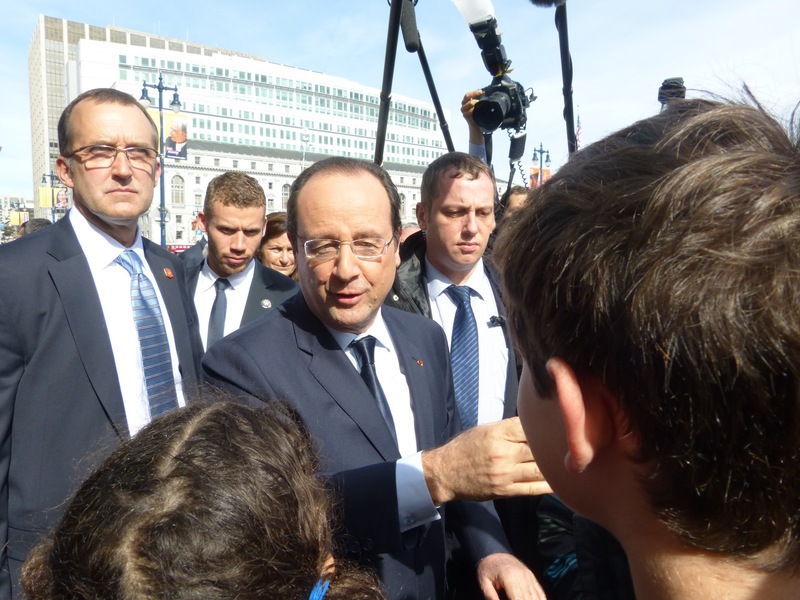 ISTP students (foreground) are personally greeted by President Hollande. Hollande personally shook each ISTP student’s hand. Due to the fact that the other French-American schools had already left, ISTP students were the only ones to receive this special greeting, which was captured by French and American news cameras. Alex K. continues, “I was on TV! There were cameras and microphones all around. The President asked, ‘Do you speak French?’ We all said yes!” It was truly an exciting moment for ISTP when our students were able to speak, in French, with the President of the French Republic. A note of thanks, to ISTP, from San Francisco Mayor Ed Lee. Philippe could not be any more proud of the students. He says, "It was a great privilege and moment of pride for me, and for ISTP, to see our students interact and talk with President Hollande." Take a look at some of the media coverage of President Hollande’s arrival!